Whenever cloud migration comes up for discussion, the analogy of building an airplane mid-flight comes to mind. There’s nothing quite like moving and re-creating all of the technology your company depends upon, even as day-to-day business operations continue. To keep your migration on course, it’s critical that those in charge have a clear sense of the company’s vision and the easiest route to get there—a bit like a flight plan. As I discussed in my last post, developing your cloud strategy begins with a good dose of experimentation, coupled with business and IT envisioning how the cloud can transform your operations. 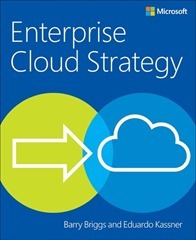 Download the free Enterprise Cloud Strategy e-book before you build your own flight plan. In Microsoft’s case, as with many other companies, we formed a cloud strategy team that included members of the enterprise architecture team, IT finance, senior technologists from the various IT applications groups, like HR, as well leaders from the infrastructure, security and networking teams. In our e-book, Enterprise Cloud Strategy, my colleague Barry Briggs and I go into greater detail on the roles of each of the groups that make up the cloud strategy team, as well as tools and technical considerations to keep in mind when developing your migration plan. The team is responsible for leading the cloud analysis and experimentation phases, as well building the architectures, patterns and guidance for deploying applications and services that will be reimagined and redesigned for the cloud. One thing that can’t be overstated is the importance of the cloud strategy team to “captain” the migration effort, to ensure the company’s long-term commitment to the cloud and to foster a culture of ongoing evaluation and experimentation. Together, this team and the culture it fosters will provide the foundation for your company’s cloud migration, and will help identify to which platforms specific apps should be moved—whether IaaS, PaaS, SaaS or a private cloud. From a cost and efficiency standpoint, each of these platforms has something to offer. On-premises cloud offers the easiest migration process but the least benefit, whereas SaaS delivers the greatest in terms of cost and efficiency. The reality for many companies is that some applications will remain on-premises, suggesting that a hybrid environment is the best choice. If you’re still thinking this through, many organizations have adopted the following principle for designing the architecture of their cloud strategy, because it is the proper sequence through which efficiency and agility are best realized: SaaS before PaaS before IaaS before private. In the end, a cloud strategy team should deliver a comprehensive plan that considers all of these platforms and describes the goals of the migration, proposed timeframes, recommended technical strategies (i.e. specifying particular platforms and tools) and expected results. After all, even if his plane is still under construction, any self-respecting captain still files a flight plan. Download the free Enterprise Cloud Strategy e-book for the flight plan to keep you on track.